A Peter Beinart article in the April 2017 issue of The Atlantic points out a correlation between the increasingly vicious and hateful political climate in the USA and decreasing participation in organized religion. The differences in positions between left and right have always been present, but we seem to be losing respect for each other and, in Beinart's words, "have come to define "us" and "them" in even more primal and irreconcilable ways." Beinart provides statistics showing that the percentage of US citizens rejecting any religious affiliation increased almost 300% from 1992 to 2014. And even the "percentage of white Republicans with no religious affiliation has nearly tripled since 1990." Beinart quotes Geoffrey Layman of Notre Dame: "Trump does best among evangelicals with one key trait: They don't really go to church." And, Beinart states, "... liberal non-attenders fueled Bernie Sanders's insurgency against Hillary Clinton. You can read the article to see why Mr. Beinart believes these religious and political trends are related, but I have a slightly different take on it. It seems to me that if we give up on the idea that we are all the result of the creative activity of a benevolent God who is "gracious, merciful, and abounding in steadfast love," we lose respect for each other and one of the most important bases of our civilization crumbles. And we fight. What are we to do? Well, one possibility for Christians is to do a much better job of learning and teaching the essentials of the Christian faith. What a mish-mash of Christian theologies we have allowed to develop in the American culture of freedom! It seems to me that the Christian faith stands on a three legged stool. 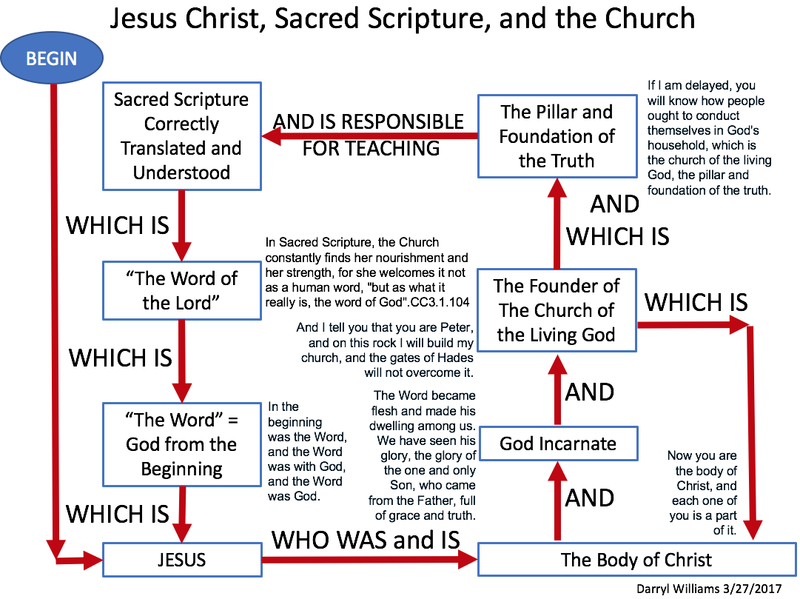 The first leg is Sacred Scripture, the written expression of "The Word," the Bible Jesus knew and read from and quoted and referred to and to which the writers of the New Testament referred, and the New Testament, written and assembled, by the Church, after, sometimes long after, the ministry of Jesus. The first complete listing of the NT Canon, after all, is from the fourth century AD. The second leg is Jesus, The Christ, eternal Anointed One, God in flesh, Immanuel, who came and lived among us and showed us The Way and died, at our hands, for us. The third leg is The Church, The Body of Christ, established by Jesus, and led by the Holy Spirit, whom Jesus promised, to follow his example and to develop and teach the basic theologies of the faith, the Holy Trinity, and the divinity of Jesus. The diagram below is an attempt to show how these three legs, Sacred Scripture, Jesus, and The Church, fit together and to present a pretty complete picture of the theology of Christian faith as I currently understand and experience it. Don't like diagrams? I'l try to explain. I believe that Sacred Scripture is the story of our developing understanding of God, that Jesus was God in flesh, with us for a specific period of time, and that the Church is his legacy, his body, through which we jointly can be in union with The Triune God, and abide in Him. That is pretty much unbelievable, isn't it. It almost sounds ridiculous. Well, I just label it Divine Mystery, subject to our best efforts to explain the unexplainable. Church is where Christians belong. Church is not a civic club, a social club, a networking organization, or a social service agency. Nor is it a hospice, just taking care of old folks as they die off. It is the Body of Christ, intended to go about doing good just as Jesus, the original Body of Christ did. Just as Jesus and his followers took up space and attracted attention in the first century, the Church is supposed to take up space and attract attention in the world today. We are to be a community, salt and light and leaven, always going out from the church building and having a positive influence and inviting and drawing people in. That is not evident from what we see? Well, Jesus never promised that the Church would be perfect but only that the gates of Hell would not prevail against it. If we did a better job with Christian education, maybe we could reduce the mish-mash and focus on these essentials and maybe the Body of Christ would grow and some of the viciousness and hate would moderate. After this many of his disciples turned back and no longer walked with him. So Jesus said to the twelve, "Do you want to go away as well?" Simon Peter answered him, "Lord, to whom shall we go? You have the words of eternal life, and we have believed, and have come to know, that you are the Holy One of God."